Quality, Tradition, Service & Excellence. Since 1992, DWL Architects & Planners, Inc. of New Mexico has designed unique, purposeful environments for clients throughout Albuquerque, NM. Our firm builds environments that are beautiful, energy efficient and safe, with a strong portfolio of examples we’re proud to showcase. We are hands-on and understanding with your needs, working diligently to create a design that fits them. 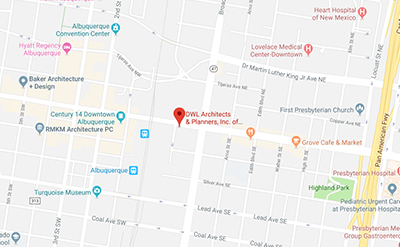 For decades, DWL Architects & Planners, Inc. of New Mexico has been pairing purpose with architectural support and considering both form and function. Every building we design is true to its purpose and designed specifically with it in mind. Our emphasis on purpose is what sets us apart—whether we’re orchestrating natural light and acoustics for a new school or designing around the atmosphere of an office space. A building is so much more than walls, flooring and a roof. It’s the embodiment of a purpose and a need. A fire station is vastly different from a bank, just like a home differs from a business. To ensure a building meets the demands of its purpose, it’s key to work with an architect in Albuquerque, NM to develop the ideal building design. Other architecture firms in Albuquerque, NM may bring beautiful designs to the table, but they’re rarely backed with the clear focus of our visions. We strive to support your needs, while creating a work of art. Let us show you how unique materials, natural elements, a balanced approach and honest architecture can come together in a building you’ll absolutely fall in love with. We’re an experienced firm that prides itself on being innovative and service-oriented. Our mission is to bridge form and function into the ideal structure for you. We’re proponents of the green building movement and building information modeling. We use data and modern practices to ensure sustainability in our designs. Our firm is affiliated with the American Institute of Architects (AIA) and the Construction Specifications Institute (CSI). Our capabilities span residential and commercial projects, as well as municipal developments and public works projects. We establish rapport with all our clients and involve them in the problem-solving process. This ensures the final results are precise and encompassing of your needs. Every building has a purpose—let us help you plan your development around its inherent purpose. Contact our firm today to begin the design and planning process with our experts. Each project will be useful and valuable for it’s intended purpose, withstanding robust use and change. Our work will embrace and express the meaningful purpose of its design. We want our architecture to serve the demands of our clients. We will harness the forces of gravity, sun, wind, topography, temperature and landscape to shape and influence our architecture. We will strive to create spaces and structures that inspire, stimulate, intrigue and allure. No project is derivative or a copy! We let materials express themselves in simple ways. We believe the physical properties of each material should drive the proper creative application. Each project will strengthen a sense of community by fitting within the surrounding context and encouraging community interaction and discourse. Each development will provide a sense of harmony with place, pride of ownership, resourcefulness, inventiveness and common good.